Primary Natural Resources copper, fish, agricultural products. 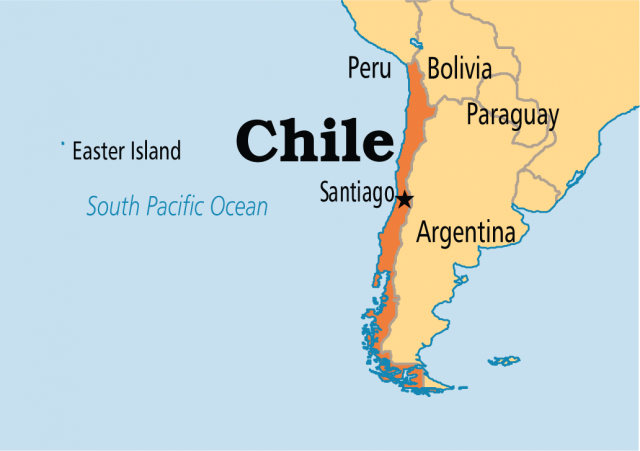 CHILE IS A LONG and narrow country in South America, about 3,999 mi (6,435 km) long and an average of 112 mi (180 km) wide. From west to east, the country is divided in three distinctive geographical spaces: the Pacific coast, the intermediate depression (depresión intermedia), and the ANDES. A mountain range known as the Cordillera de la Costa (Mountains on the Coast) separates the coast from the intermediate depression. The ocean has abundant natural resources, the southern intermediate depression has rich soils, and the Andes has provided essential hydraulic (rivers that flow from east to west) and mining resources, and has had a crucial effect on the climate. In addition to its South American territory, Chile has rights to parts of the Antarctic continent and island territories off its coast in the PACIFIC OCEAN (most notably EASTER ISLAND). From the far north to the extreme south, Chile has a large variety of climates, environments, natural resources, and vegetation. The Great North (Norte Grande), what today includes the regions of Tarapacá and Antofagasta, was incorporated to the country following the War of the Pacific (1879–83) against BOLIVIA and PERU. This region includes the Atacama Desert, one of the driest deserts in the world, and with the exception of a few oases, the environment is extremely harsh, water resources are limited, and vegetation is scarce. The principal cities are located along the coast, where there is also an important and growing fishing industry. The interior and the northern Andes are rich in mineral resources. Nitrate was exploited between 1880 and 1930s. In the 1930s, large-scale copper replaced nitrate as the most important Chilean export. Today, the mine of Chuquicamata continues to be the largest open-pit mine in the world. Despite the efforts of decentralization, the center of Chilean political, social, and industrial life continues to be the Central Valley. About 70 percent of the population lives in the Central Valley (which includes the regions of Valparaiso, O’Higgins, and Maule and the Metropolitan or capital region). As with many other Latin American capitals, Santiago suffers acute problems of atmospheric pollution and congestion. The central valley has a Mediterranean CLIMATE and rich soils, favoring the development of agriculture. Today, fruit and wine have become important commodities. Abundant rainfall and vegetation characterize the southern provinces. Fishing, agriculture, and livestock have been among the most important economic activities. The city of Concepción, the third-largest city in the country, has substantial industrial activity, making a pole of development and growth in the south. South of Concepción and the the Bío Bío River lies La Frontera, which until the 1870s under the control of the Mapuches, native Latin Americans who had successfully resisted Spanish colonization. Today, the Mapuches are still struggling to recover their land and be recognized as a distinctive ethnic group in the country. Further south lies the lake region. Settled by German immigrants in the mid-19th century, its amazing beauty, lakes, and volcanoes have made it a favorite tourist destination. While a third of the national territory lies south of the city of Puerto Montt and the Seno de Reloncaví, it has only about 3 percent of the country’s population. Poor transportation has made communication difficult. Only in 1988, the country inaugurated the Southern Highway, a 683-mi (1,100-km) road that joined Puerto Montt and Puerto Yungay. Historically, the city of Punta Arenas has been an important port strategically located in the Strait of Magellan. Today, the region of Magellan is also important because of the petroleum industry.